2017 CA - A loose pit bull attacked a police K9 in Oakhurst park when the officer handler responded to a call. The police officer fired shots at the pit bull which was taken by animal control and the owner was cited for violating leash laws. 2017 GA - While police arrested a man, another man was ordered to let go of a pit bull and get on the ground. The pit bull attacked a police K9 and police were forced to shoot the pit bull. 2017 CA - A pit bull attacked an on duty police K9 officer named Hancock while police were searching a property and serving a warrant. The pit bull bit Hancock's leg and clamped onto his neck. An officer shot the pit bull dead. Hancock received emergency veterinary treatment and will recover. 2017 CA - While pursuing a fleeing suspect, police and K9 officer Cort entered a yard with a stray pit bull in it. The pit bull attacked Cort and police had to shoot the pit bull to stop the attack. The pit bull died at the scene. 2017 IL - A pit bull attacked a working K9 in Springfield IL. The K9 handler had to shoot the pit bull 5 times and kill it to stop the attack. The pit bull had reportedly escaped a cage and then jumped over a fence to escape. 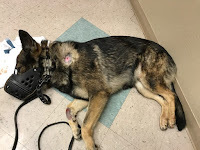 2017 CA - Belgian Malinois K9 Jarno was attacked by a stray pit bull while walking with his handler on their way to a fundraiser. The pit bull inflicted numerous bites to Jarno's abdomen, but he is expected to recover after a couple weeks rest off duty. 2016 OH - When police responded to a fatal shooting a pit bull tried to attack a police K9 officer. Police shot and killed the pit bull. 2016 OH- The Franklin County Sheriff's office was holding a community relations event right in front of the courthouse when a loose pit bull attacked the police K9 officer, Vando. The K9 handler and other officers shot the pit bull several times, killing it, in front of a horrified public and the owner was arrested. No matter how much propagandizing pit bull pushers do, pit bulls continue to teach us what pit bulls are really all about. When pit bulls show you what they really are, believe them. 2016 MO - K9 Joey died 6 months after he sustained injuries while protecting his handler from a pit bull attack. He was buried with honors. RIP K9 Joey. One news outlet told the news while the other censored itself and refused to acknowledge that the "aggressive dog" was a pit bull. 2016 NY - A loose pit bull attacked Wyatt, an off duty NYPD Transit K9 officer, and his handler. The pit bull charged through a fence and across a road just so it could attack the K9 officer. The handler was able to kick the pit bull away and Wyatt escaped with minor injuries. 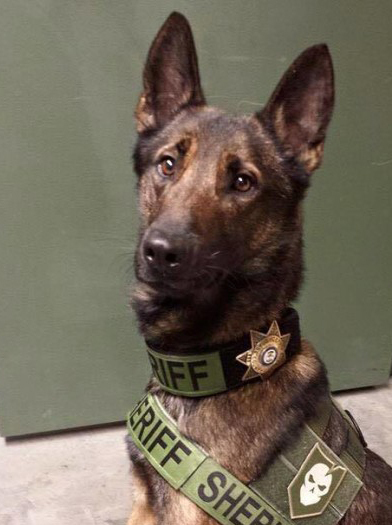 2016 MS - K9 Ringo and his Hancock County Sheriff's deputy handler were attacked by a pit bull. The deputy was putting Ringo back into the back seat of the cruiser when a pit bull leapt in and attacked Ringo. The pit bull attacked the deputy when he tried to stop the attack. Ringo attacked the pit bull again and the pit bull went for Ringo's throat. The deputy shot the pit bull which ran off and will survive. Ringo will recover. 2016 WA - K9 Laslo was working with other law enforcement officers to arrest a man wanted on a felony warrant. Two pit bulls ran out of the felon's house when another resident of the house tried to sneak away to avoid being picked up on a warrant. The two pit bulls attacked Laslo and his handler Officer Thurman. Thurman shot one of the pit bulls which ran off and died. One of the owners got the other pit bull under control. 2015 MI - a Flint police K9 officer named Zeke was attacked by a pit bull while searching for a suspect. Troopers shot and killed the pit bull. Zeke is expected to recover. 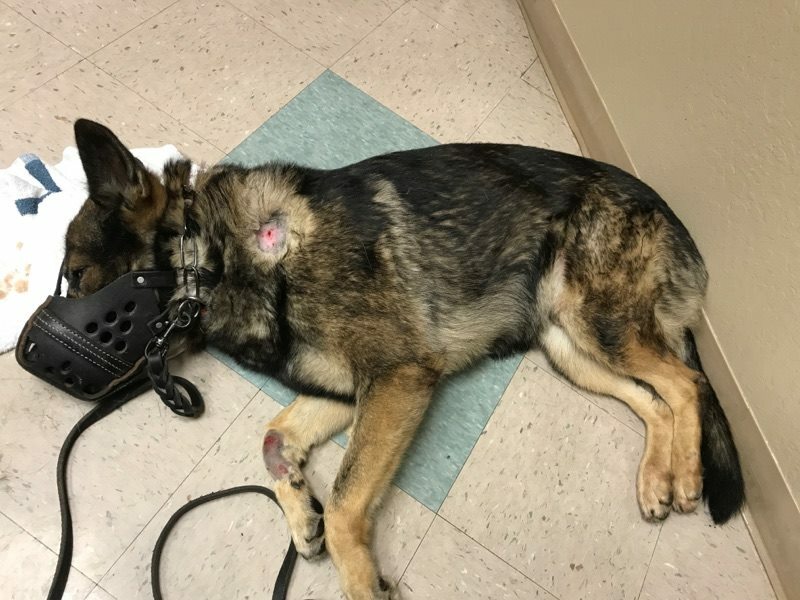 2015 WA - A Centralia police dog who was chasing after a suspected car thief was attacked by a pit bull, and during the melee, the pit bull's owner was bit, according to police. 2015 NC - A yellow lab named Gunner, an Avery County sheriff’s Office K9 officer-in-training, was killed by a stray pit bull while training with her handler in her own yard. Gunner succombed to massive head and chest trauma and an injury to her back leg. Her handler was traumatized. 2015 FL - A Lee County K9 unit suffered a pit bull attack while deputies were executing a search and the search took them through an unfenced yard of a pit bull. The pit bull was shot. 2015 NV - Two loose dogs came upon a police dog that was searching for a suspect. One of the two dogs was a pit bull. Only the pit bull attacked the police dog. Police shot the pit bull and it eventually died. The police K9 was treated for wounds. 2015 ID - While officers attempted to serve a warrant, the felony suspect bolted from his house and was followed by a pit bull which attacked the K9 officer and its handler. Police shot the pit bull to stop the attack. 2015 NC - K9 Mako died of injuries sustained three months earlier when he was attacked by another dog while assisting members of the agency's Vice / Narcotics Division serve a warrant near Shelby, North Carolina. 2014 IL - A Chicago police dog named Ditto is undergoing surgery after pit bulls attacked him inflicting severe injuries. Ditto was off duty and being walked by his handler at the time. 2014 UK - Max, a police dog was savaged by a pit bull terrier and had to be retired from service. His handler is devastated by the horrific attack. 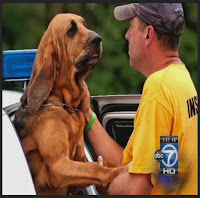 2014 AL - A police dog was severely mauled by a suspect’s two pit bulls. She needed 17 staples in her hip. Police think she will be able to return to work. 2014 WA - Police K9 Laslo was attacked by a pit bull while in pursuit of a burglar. The handler shot and killed the pit bull to get it to stop attacking. 2014 - During a search for a felony suspect, a pit bull leaped out of a window to attack K9 officer Tessa. 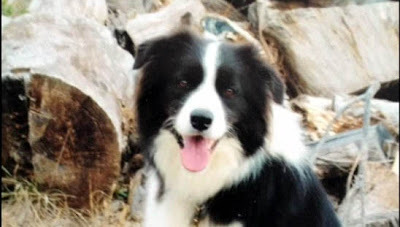 Tessa was accidentally shot when an officer opened fire on the pit bull to stop the attack. Tessa is expected to make a full recovery. 2014 FL - A St. Johns County Sheriff's Deputy and K-9 deputy 'Ryker' were searching for a 13 year-old suspect who ran from a stolen car when Ryker was attacked by a pit bull. The officer shot at the pit bull which ran away. The suspect got away. 2013 FL - A Temple Terrace officer shot a pit bull that was attacking a police canine Monday during the arrest of a drug suspect. The police dog is expected to recover. The pit bull was not killed. 2013 PA - Pit bulls attack officer and K9 during a heroin bust. 2013 NY - While investigating a report of a burglary in progress, a police K9 was attacked by a pit bull in the house. Police had to shoot the pit bull to stop the attack and the pit bull eventually died. 2013 CA - A pit bull attacked a K9 and had to be shot to stop the attack while police responded to a report of gun shots fired. The pit bull died soon after. 2012 CA - While arresting a fugitive, a pit bull ran from the fugitive's backyard and attacked K9 handler Melissa Drane and the police K9 named Kasper. The pit bull had latched on to Kasper’s throat when an officer shot at the pit bull twice to stop the attack. The shots missed, but the pit bull let go. 2012 IL - Vvorra, a 3-year-old Belgian Malinois canine partner-in-training of Chicago Police Officer Kevin Keel, was attacked by an unleashed pit bull, was rushed to emergency care, and is expected to be back on duty. 2012 IA - Video news account of a pit bull attacking a police K9 named Damien while on duty. The pit bull was tazed and ran off with a barb in its back. Damien was no seriously injured. 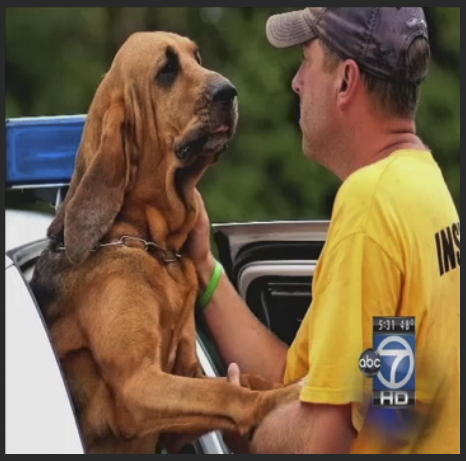 2011 VA - K9 Maggie, a bloodhound, was searching for a suicidal man when a pit bull fatally mauled her. In her career, she had responded to 348 calls. Her handler is devastated. 2011 IA - Pit bull came out of nowhere after the handler officer and K9 officer had completed a search and were returning to their car. The pit bull was tazered, but got away. 2010 BC - Pit bull attacked an RCMP police dog in training and was shot and killed to stop the attack. Owner whines that her out of control, vicious pit bull should not have been shot. 2008 NC - Police K9 labrador drug detection dog attacked by suspect’s pit bull. Jet, the K9 is OK, the police handler shot the pit bull and it eventually died after running away. 2002 IN - K9 officer Fax died after undergoing emergency surgery and treatment for wounds received while the canine was defending two Lake County Officer’s who were attacked by a vicious Pit-Bull while responding to a call. 1998 IL - Pit bull at drug house attacked a drug detection K9.